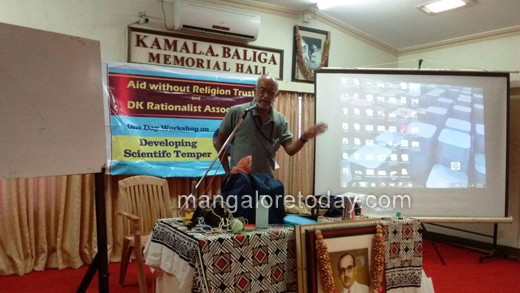 Udupi, March 13, 2017: In a mission to conduct activities to develop scientific temper, the Dakshina Kannada Rationalist Association and Aid Without Religion trust have started a series of one day workshops at various districts across Karnataka with the co-operation of local interested individuals and organizations. 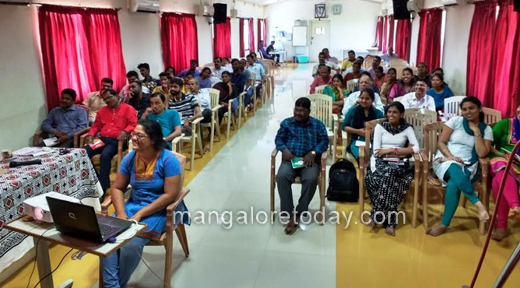 Such a workshop was held in the auditorium of the Dr. A.V.Baliga memorial hospital at Udupi on Sunday, 12th March with the sponsorship of its medical director Dr.Venkatray Bhandary. This one day workshop dealt with various aspects of applying rational approaches to daily life and conducting activities to take the same to the people. The topics dealt with were the mindset that leads people to resort to irrational solutions for their problems, the modus operandi of so called godmen, the methods used by quacks etc. The activities included demonstrations to encourage rational thinking and questioning. Video footages of the so called godmen performing their allege miracles were shown and explained. The terminologies like atheism, rationalism, humanism were defined and a concise history of such movements was also presented. A very common field where claims of paranormal are made is the field of medicine particularly for ‘cure’ of some at present incurable diseases these were discussed along with demonstrations and videos. Due to supposedly ‘abnormal’ behavior associated with psychiatric disorders and the social stigma associated with them, patients and their dear ones tend to ascribe these to supernatural causes and take ‘treatment’ from ‘ healers’ who claim to cure them! 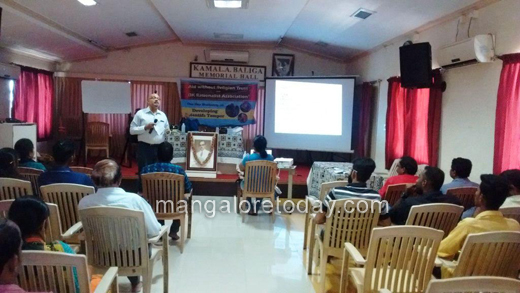 The nature of psychiatric disorders and their treatment was conveyed to the participants by Dr.Venkatraya Bhandary who is a psychiatrist by profession. Narendra Nayak, the president of Federation of Indian rationalist association was the other resource person. Material prepared by experts in the field of medicine Dr.Shrinivas Kakkilaya and the former president of the Association of psychiatrists of Karnataka Dr.K.S.Madhav Rao were also used for the program. About fifty participants were present and plenty of questions were asked and doubts cleared. There was no formal inauguration or valedictory ceremonies. The whole workshop was devoid of any such wastage of time. The audience were mostly of young people and students. Such workshops are planned in every district of the state and a five day state level workshop has been planned after selecting the best of the activists from each of the districts. Those who want to conduct such workshops in their places/institutions can get in touch with us. Great news. Thank you. It would be very helpful if the programme schedule is announced in advance so that those interested to participate will be aware. Mr Nayak you are great. We are with you because you always take a stand for justice . It is very worthy hearing to lectures of Mr Narendra nayak. In present generation there are very few on his kind who honestly fights the corription.